Low weight and wide tyres give this bike an easy ride. The bike remains stable thanks to a sturdy double stand and handlebar lock. Your children sit comfortably on the little bench seat with safety belts. Want to cycle into the city on a bicycle that can stand a good deal of punishment? 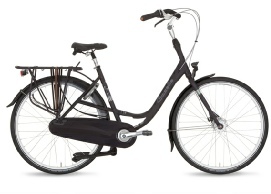 Gazelle’s comfortable city bicycles are superbly suited for this task. You can count on them under any conditions. Vandal-proof, reliable, sturdy and yet colourful... There’s always one that meets your requirements! Cycling into a headwind or uphill isn’t always such fun. That’s why Gazelle is introducing a complete range of electric bicycles for every type of cyclist. With them you will enjoy every bike ride and keep going effortlessly. The innovative electric bicycles by Gazelle will give you just that little extra boost, to match the assistance you wish to have. 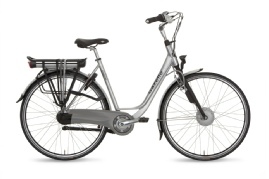 Whether you are looking for optimum efficiency while touring across flat terrain or you need an electric bicycle with an extra powerful motor for hilly terrain, at Gazelle you are sure to find what you are looking for! Moreover the removable lithium-Ion batteries have an average range extending to as much as 265 km/165 mi (platinum battery) so you will always have energy to spare! 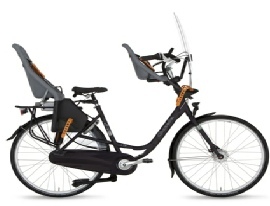 The nice thing about a Gazelle electric bicycle is that it isn’t obvious that it is an electric bike. 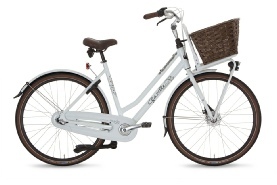 The battery is subtly located under the luggage carrier and the compact electric drive is built into the front hub. It is not without good reason that Gazelle electric bicycles have been carrying off prize after prize for years. In 2009 the Chamonix Innergy was awarded the title of Dutch Bike of the Year and Test Winner in the Dutch Algemeen Dagblad newspaper, moreover in 2011 the Orange Pure Innergy was hailed as the favourite by test riders of the Dutch FietsActief magazine as well as being nominated for Dutch E-Bike of the Year. Looking for a light and comfortable leisure bike that serves you on any terrain? A mile-eater for sporty rides, daily commuting and faraway outings? 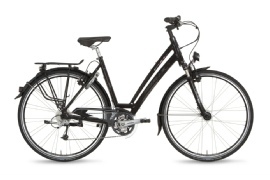 If so, choose one of the fast Gazelle leisure bikes with over twenty speeds, automatic lighting and usually even a suspension front fork as standard. 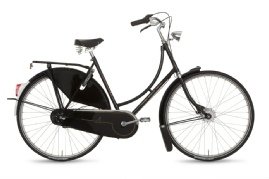 Of course all models feature a lightweight aluminium frame which gives you a nice fast and easy ride. 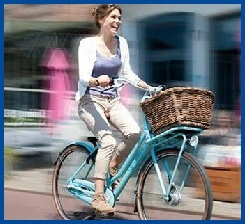 Royal Dutch Gazelle employs around 450 employees at its factory in Dieren producing more than 300,000 bicycles a year. 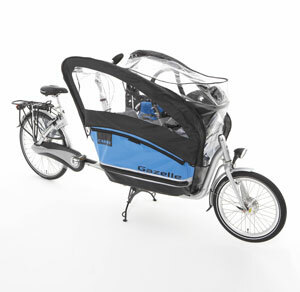 Gazelle is market leader in the Netherlands. At Gazelle bikes, they believe: the better your bike is, the more often you will cycle! Ever since 1892 we have been doing everything in our power to make the finest quality bikes that provide the smoothest and most comfortable ride possible. This is how Gazelle bikes makes you ‘feel like cycling’ every day. With over 48 models available in different frame sizes and colours, the choice is endless. Email me the following and I can send you a refined selection to consider, including costs. 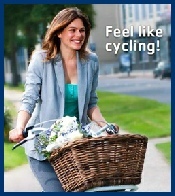 For happy cycling you need to sit comfortably on your bicycle. 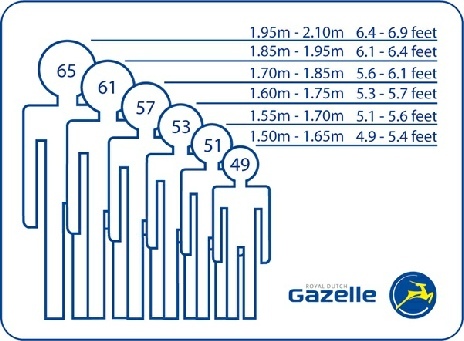 An indication of the frame size that is tailored to your height can be found in the table below. 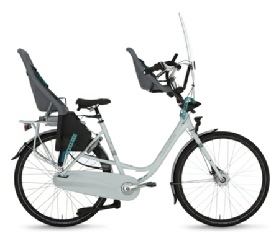 This bike features a much longer distance between the saddle and handlebars for extra room to be able to pedal without any uncomfortable leg splaying. The bike remains stable when stationary and little ones are dismounting, thanks to a sturdy double stand and handlebar lock.